Magnetic Resonance (MR) images are affected by random noise which limits the accuracy of any quantitative measurements from the data. We have analyzed and adapted a recently proposed filter for random noise removal in MR magnitude images. This parametric filter, named Non-Local Means (NLM), is highly dependent on the setting of its parameters. We have experimentally found the optimal parameter selection for MR magnitude image denoising. Besides, the filter has been adapted to fit with specific characteristics of the noise in MR image magnitude images (i.e. Rician noise). From the results over synthetic and real images we think that this filter can be successfully used for automatic MR denoising. Manjón J.V., Carbonell-Caballero J., Lull J.J., García-Martí G., Martí-Bonmatí L., Robles M. MRI denoising using Non Local Means. Medical Image Analysis, 12(4):514-23, 2008. 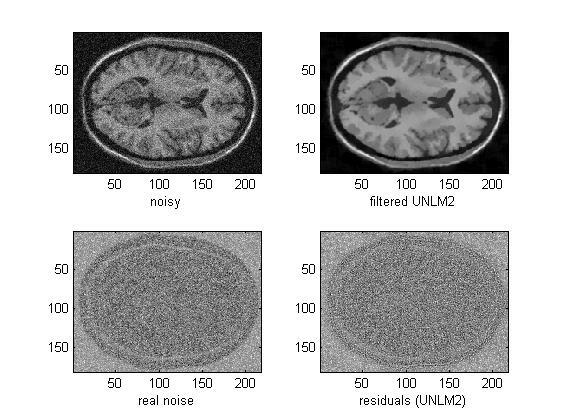 Figure 1: Example UNLM denoising.